Time to get back to the regularly scheduled color of the month! I love aqua all year and in the winter I think it feels extra fresh and crisp. Aqua melmac makes the grade along with some awesome pincecone glasses by Marcrest Stetson. 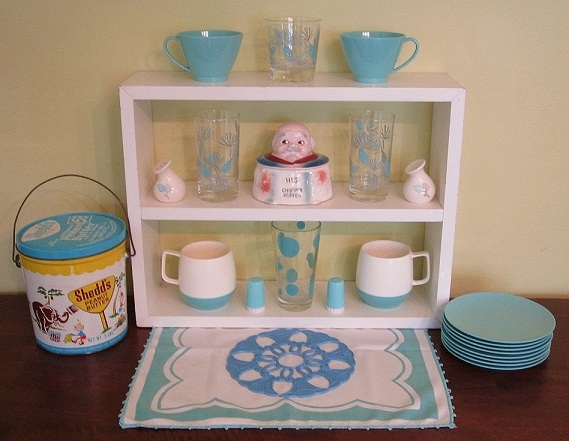 Matching salt n p's and aqua shakers on the bottom sit next to Vacron Bopp Decker mugs. I love the polka dot glass! The false teeth holder is a hoot, and the 5 lb peanut butter pail makes a great display piece! Wintery fresh! 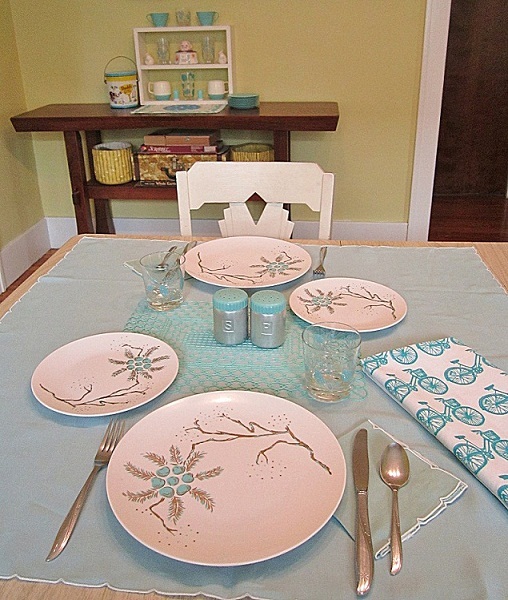 I adore these melmac plates with aqua and metallic gold accents! The pinecone glasses are by Marcrest Stetson and the plastic doily placemat makes a nice anchor for the aqua topped aluminum salt and p's! Plus a Limited Edition blue artgoodies bike towel reminds you that Spring will be around the corner! I thought I’d put this handy tip on my blog for ya. I don’t like to buy a lot of wrapping paper. I, of course, keep some vintage on hand, and usually I buy one non holiday looking versatile holiday paper on sale after Christmas to get me through the year. But sometimes you need something you don’t quite have. 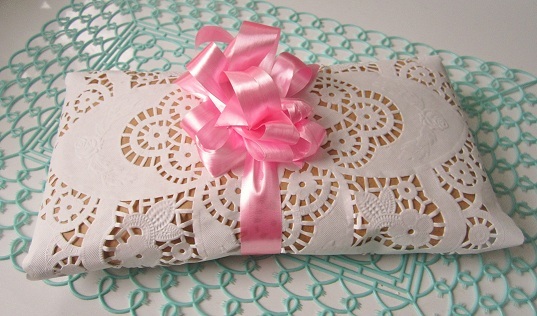 Today I needed something more girly than usual so I broke out the old brown paper bag, doily, and homemade bow trick! It’s something I’ve used on multiple occasions. How cute is this! Also adorable with a solid color wrapping paper. 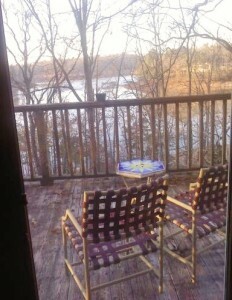 I’m back from a wonderful and much needed New Year’s vacation. I spent the week in Georgia with lazy days looking out over the lake, fires in the fireplace, and the kind of laughter that makes your stomach hurt. It was exactly how a New Year should start, catching up with the dearest of friends. I hope ya’ll had a wonderful holiday and feel relaxed, refreshed, and ready to start a wonderful New Year! Happy 2013! I can’t wait to share some of the super exciting things ahead! Stay tuned!